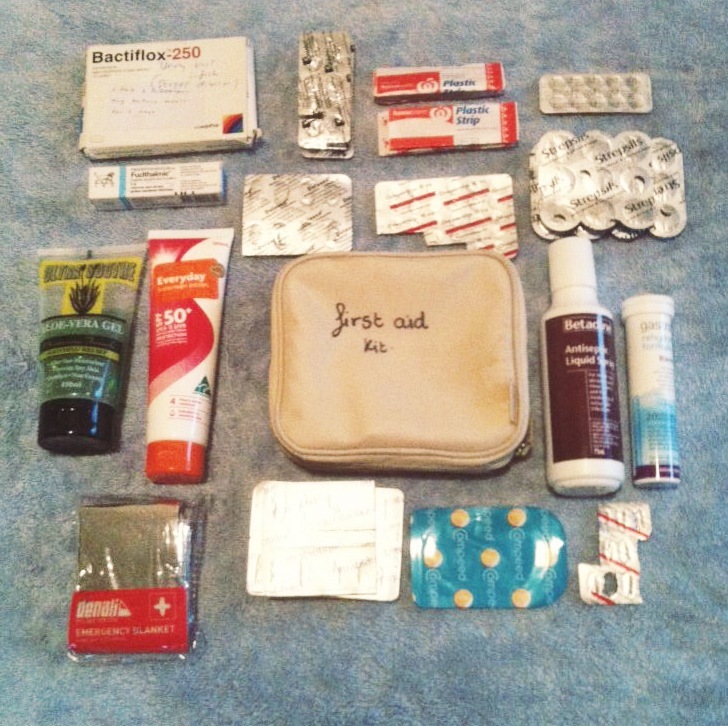 These are the contents of our first aid kit. Though the things we’ve included are applicable and useful in most countries, we’re bringing some medicines that we think will be especially beneficial in South East Asia. This is for you to ignore the first time you go to the beach thinking that you’ll only get slightly burnt and end up with a nice tan. You’ll use it in the future after recovering from your horrendous sunburn. This is for that time you can’t be bothered forget to put on sunscreen. It’s super soothing and provides instant cooling relief from a bad burn. Start applying it as soon as you see yourself going red. This stuff kills bacteria dead. It’s easy to apply and great for preventing infections. Unfortunately, due to it’s red-ish brown colour, it makes any wound look like a zombie bite. Domperidone helps suppress nausea and vomiting which is really handy when you’re feeling sick on long journeys. It’s a good idea to take a few of these if you’re prone to sea sickness as there are many islands in South East Asia that are only accessible by boat. If you ever get a tension headache, this is the stuff you take to fix it. Dolased is also a mild sedative so be prepared to become unusually mellow after using it. What’s worse than getting conjunctivitis when you’re traveling? Nothing… Nothing is worse… Well, except for a lot of other things. Even though it’s not the worse thing to get, it is painful, annoying, and highly contagious. Use some of these eye drops to get rid of it quickly. Obviously for use when you cut yourself, or when somebody else cuts you. If it’s the latter, I hope it’s an accident, otherwise you might want to consider hanging out with different people. These things can be a life saver if you have been suffering from diarrhea, travelers gastroenteritis, or excessive vomiting. They replenish essential electrolytes, minerals, and help prevent dehydration. Imodium is effective in the treatment of multiple types of diarrhea, including travelers diarrhea. This medication can be a god send on a long bus ride. After all, there’s no bigger conversation ruiner than soiling yourself. Don’t worry if you do, many travelers have required a change of pants upon arrival at their destination. For when you convince yourself that your favourite pair of shoes will be comfortable enough to take with you, and realise that they aren’t. This is a non-refrigerated probiotic. It’s full of good bacteria that will keep the bad stomach bugs and other nasty bacteria at bay. Great for a sore throat and phlegmy cough. Can also be used as a bad substitute for candy.. This is prescriptive medicine that can be used to treat anything from urinary tract infections to severe diarrhea. This supplement is great for keeping iron and folic acid levels up. Spasfon provides pain relief for an array of gastrointestinal problems. It’s something i’d definitely recommend for those who commonly suffer from stomach pains. This is my medicine of choice for most headaches. It’s fast working and rarely lets me down. Aspirin is the medicinal “jack of all trades”. Used for headaches, body pains, fevers, and as an anti-inflammatory. It’s a must have for all travelers.